Enhanced decision-making and reporting strategies. The Art of Service has designed this toolkit to introduce IT Risk Management main concepts, as well as provide you with the tools to successfully create a workable Risk Management culture in your organization. We provide you with step-by-step guides, templates, and best practice examples that will enable you to meet this challenge head-on. Identify Threats & Opportunities Within Your Organization Today! IT Risk Management has long been a concern for business operations, but in the last couple of decades, its importance has increased, as new sources of risk evolve and the need for quality in a rapidly changing consumer environment has gained greater value. Traditionally, risk has been seen as a threat to business; however, new paradigms are demanding that opportunities to business also be seen and managed as risk, as both threats and opportunities bring the same attribute to a situation—uncertainty. What business risks are involved in using IT to support business functions? What technology risks are associated with the use of IT architectures, systems and processes? 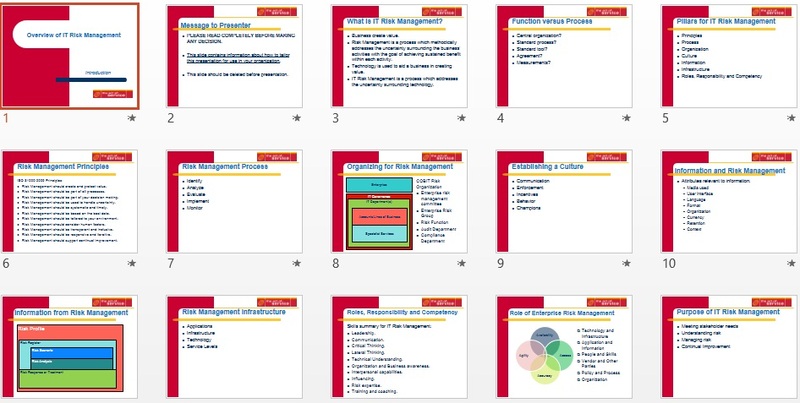 The IT Risk Management Toolkit is designed to aid IT professionals and stakeholders in understanding what risk management is and how it can be applied practically to an IT environment, using specially designed implementation tools. 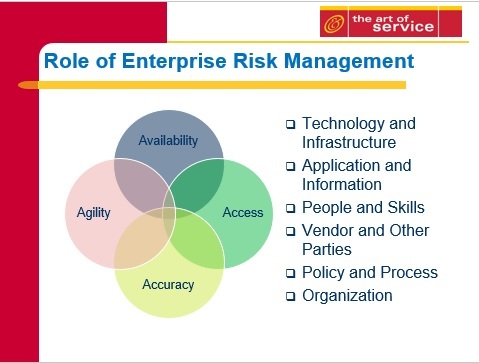 Establish a risk management framework for your IT environment. Identify the potential factors in implementing any IT risk management solution or individual risk response. Identify and fill the necessary risk management roles necessary for an effective risk management solution. Effectively plan and develop a successful risk management solution. Update and maintain a high level of maturity for the implemented risk management structure. The Art of Service has designed this toolkit to introduce IT Risk Management concepts, and provide you with the tools to successfully create a workable IT Risk Management culture in your organization. This toolkit provides answers to all of your IT Risk Management questions, and is designed to provide a guiding hand to assist you in improving your knowledge and understanding of IT Risk Management by offering a step-by-step, easy-to-follow roadmap. 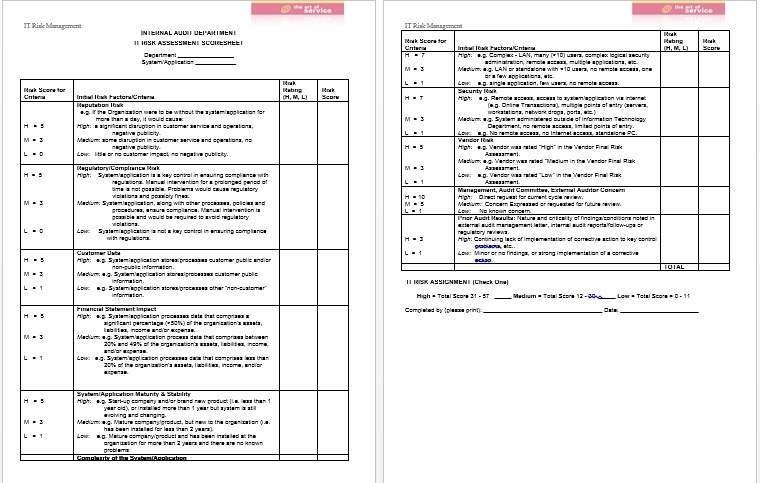 It also includes easy-to-use templates, assessments, presentations, and documents that can be adapted to your organization's requirements. The additional resources will enable you to improve your organization’s IT Risk Management understanding and knowledge base. 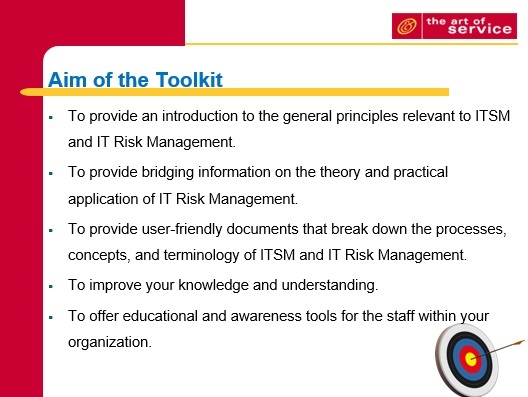 Purchase The IT Risk Management Toolkit – Second Edition Today! 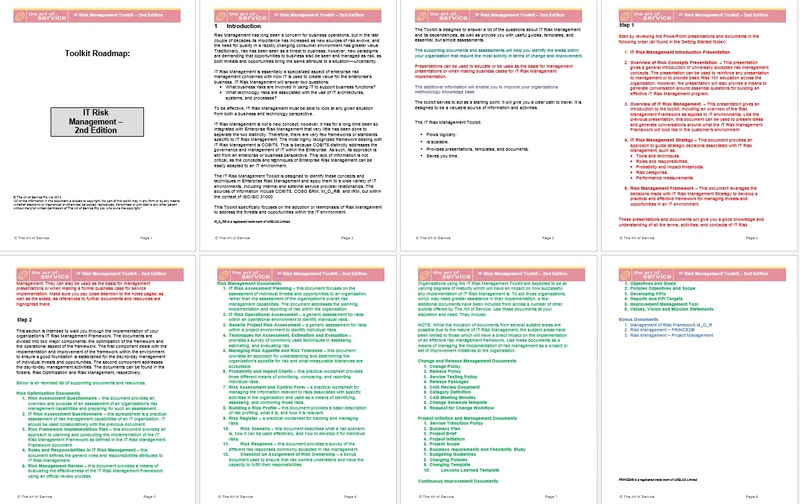 It took us 80+ man-hours to produce The Risk Management Toolkit – Second Edition: analyzing, processing, selecting, editing, and building the “flow” from the countless documents and data we have produced over months (at least $50/hour that comes to over $4,000 of time). In total, the end result — The Risk Management Toolkit – Second Edition— reflects over a full-time employee’s fortnight work. At the Art of Service, we know how important your time is for you and we also understand that nobody can substitute you in certain scenarios. This is why we give you the results without you having to do all the legwork; we do the researching and the analysis, and the collating of the information we find.